Hyphoderma setigerum (Fr.) Donk is a white-rot wood-decaying corticoid fungal species. It occurs worldwide from tropical to temperate regions. However, taxonomic studies in recent decades showed that H. setigerum is a species complex with four separate species, before this study. Hyphoderma pinicola sp. nov. was collected on dead wood of Pinus yunnanensis Franch. in the temperate montane belt at 2200–2400 m altitudes, in Yunnan Province of China. Within the H. setigerum complex this new taxon is distinguished by having 2-sterigmate basidia, long basidiospores, and nearly naked septocystidia. A description and illustrations of this new species are provided, along with a key to five species of the H. setigerum complex. Phylogenetic reconstruction based on 5.8S-ITS2 sequences indicated that H. pinicola belongs to the H. setigerum complex and has a separate position within the clade including H. subsetigerum and H. setigerum s.s. Bayesian inference of phylogeny based on two datasets, ITS and 28S nuclear ribosomal DNA sequences, confirmed the independent status of H. pinicola. Morphological and phylogenetic studies showed that H. pinicola represents a fifth species of H. setigerum complex. Hyphoderma Wallr. is the largest genus of Basidiomycota with resupinate non-poroid basidiomata. Currently, 103 species are recognized under Hyphoderma in Index Fungorum (Kirk, ). According to Dai (), 24 species of Hyphoderma s.l. (including Mutatoderma (Parmasto) C.E. G mez and Peniophorella P. Karst.) were listed in the mycobiota of China. Hyphoderma setigerum (Fr.) Donk occurs worldwide from tropical to temperate regions. However, taxonomic studies in recent decades showed that H. setigerum is a species complex with four species. A new species belonging to the H. setigerum complex is described in the present paper. This new taxon is based on specimens collected in 2001 on dead branches of Pinus yunnanensis Franch., from the temperate montane belt of Yunnan Province, China. The specimens studied of this new species are deposited in the herbaria TNM and MSK (herbarium acronyms follow Index Herbariorum, http://sweetgum.nybg.org/ih). The isolate is kept in the culture collection of TNM. Description of macromorphology is based on dry basidiomata. Microscopic measurements and drawings were made from material mounted in 3% KOH water solution. Melzer’s reagent was used to examine amyloidity or dextrinoidity of spore walls, but also to study crystalline incrustations on hyphae, or in the hymenium. Cyanophily of the spore wall was tested in cotton blue-lactophenol solution. To determine average spore size, 30 randomly selected spores from a squash basidioma preparation were measured. Nuclear ribosomal DNA sequences of Hyphoderma were analyzed in addition to morphological study. The material for DNA isolation was mycelium grown in pure culture (Wu 0108–36), and basidioma pieces taken from herbarium specimens (TNM F13635, TNM F13637). Both kinds of material were homogenized in liquid nitrogen. DNA was extracted with Plant Genomic DNA Extraction Miniprep Kit (Viogene, Taiwan), according to manufacturer’s protocol. Primer pair ITS1/ITS4 was used for amplification of internal transcribed spacer region, including ITS1, 5.8S, and ITS2, under PCR conditions, described in White et al. (). The DNA fragment of ribosomal large subunit gene (28S), was amplified with primers LR0R/LR5 (Moncalvo et al., ), following PCR settings as described in Wu et al. (). Amplifications were run on a Mastercycler Gradient 5331 thermal cycler (Eppendorf, Germany). Amplification products were purified with a PCR-M Clean Up kit (Viogene) and sequenced with an ABI PRISM BigDye Terminator Cycle Sequencing Ready Reaction kit on ABI 3730 DNA sequencer (Applied Biosystems, USA). The resulting sequences were deposited in NCBI GenBank (Table 1). *Data in bold indicate the sequences obtained in this study. **In GenBank under the name Hyphoderma heterocystidiatum (Burt) Donk. The datasets were composed of the sequences obtained in this study and taken from GenBank (Table 1), with the aim to elucidate phylogenetic distances between the new taxon and other Hyphoderma species. Two species of Mutatoderma, earlier known under Hyphoderma, were added to both 5.8S-ITS2 and 28S datasets. From about 50 ITS sequences of H. setigerum available in GenBank, we selected those representing the main clades within this species complex (Nilsson et al., ). The selected taxa in the ingroup belong to residual polyporoid clade of Agaricomycetes (Binder et al., ). Phanerochaete sordida (P. Karst.) J. Erikss. & Ryvarden, a member of phlebioid clade, was selected as an outgroup in both datasets. Sequences were aligned on-line in MAFFT v. 7 (http://mafft.cbrc.jp/alignment/server), using E-INS-i strategy for ITS and G-INS-i for 28S (Katoh et al., ). Before alignment, ITS1 and 28S segments were cut from the sequences where needed. Sequences that were too short were removed from the datasets after preliminary alignments. Final datasets were edited manually in MEGA v. 3.1 (Kumar et al., ). Ready data matrices, together with resultant phylograms, were deposited in TreeBase (http://purl.org/phylo/treebase/phylows/study/TB2:S16046). The best-fit models of nucleotide evolution were estimated by MrModeltest v. 2.3 (Nylander, ), with Akaike Information Criterion as a relative quality measure of the model (Posada and Buckley, ). The input file for MrModeltest was generated in PAUP* v. 4.0b10 (Swofford, ). Bayesian analysis of phylogeny was performed in MrBayes v. 3.2.1 (Ronquist and Huelsenbeck, ). Both 5.8S-ITS2 and 28S datasets were individually analyzed in two independent runs, each with four MC3 chains running for 1 million generations, with tree and parameter sampling every 500 generations. Burn-in was as default setting (discarding 25% of samples). The datamatrix of 5.8S-ITS2 was analyzed with different sets of parameters for two partitions, 5.8S and ITS2, according to best-fit models. FigTree v. 1.3.1 was used to view and capture the resultant phylograms and CorelDraw v. 9 for drawing the images. Yurchenko & Sheng H. Wu, sp. nov. Figures 1 and 2. Macromorphology of Hyphoderma pinicola (TNM F13635). A, Basidioma in central part (holotype); B, Basidioma in marginal part (holotype); C, Thin, minutely porulose basidioma. Scale bars = 1 mm. Micromorphology of Hyphoderma pinicola (TNM F13637). A, B, Vertical sections through basidioma; C, Naked and encrusted subicular hyphae; D, Two straight and one distorted septocystidia; E, Basidia; F, Normal basidiospores; G, Basidiospore with a false septum. Scale bars: for A = 100 μm; for B–G = 10 μm. China. Yunnan Prov., Hoching County, Sungkuei, alt. 2200 m, on dead corticated branch of Pinus yunnanensis, coll. S.H. Wu & S.Z. Chen, 1 Aug 2001, Wu 0108–32 (TNM F13637; isotype in MSK). Specific epithet refers to the host preference (Pinus). Basidioma thin; hymenial surface chalky white, warted; septocystidia scattered, almost naked and often thin-walled; basidia with two large sterigmata; basidiospores (10–)13–16(–17.5) μm long, predominantly suballantoid. Basidiomata effused, membranaceous, 60–150 μm thick. Hymenial surface chalky white, minutely warted (3–4 warts/mm), between warts from the beginning minutely porulose, then continuous, minutely cracking with age. Margin zone up to 1.5 mm broad, concolorous with the main hymenial surface, abrupt or usually diffuse or slightly fibrillose. Hyphal system monomitic, all hyphae colorless, thin-walled, clamped at all primary septa. Subiculum thin, consisting of thin, fairly compact layer of more or less horizontal hyphae next to the substratum, and loose intermediate layer composed of variously oriented hyphae. Subicular hyphae moderately branched, 3–4.5 μm diam, naked to richly encrusted. Subhymenium not distinctly differentiated from subiculum. Subhymenial hyphae moderately to richly branched, 2.5–3 μm diam, moderately to richly encrusted (most incrustation dissolving in KOH solution). Cystidia of two kinds: (1) septocystidia scattered, projecting, irregularly cylindrical, straight to strongly twisted, simple or branched, with (2–)4–6(–8) and more predominantly clamped septa, apically near cylindrical or subcapitate, 65–180 μm long, up to 7–11 μm broad in swellings and the least 3.5 μm broad in constrictions, colorless, moderately thin-walled (walls up to 0.5 μm thick) to seldom thick-walled (up to 2 μm thick), naked or slightly encrusted, especially in basal part; (2) aseptate cystidia may be found in younger portions, slightly protruding, subcylindrical, 35–45 × (4.5–)6–7 μm, thin-walled, naked. Basidia subcylindrical or narrowly utriform, 25–28(–32) × 5–6.5 μm, colorless, thin-walled, naked, with two sterigmata measuring 6.5–7.5(–9) × 1–1.5(–1.8) μm. Spores cylindrical to allantoid, rarely slightly sigmoid, (10–)13–16(–17.5) × (3.5–)4–4.5(–6) μm (rarely up to 19.5 μm long), colorless, thin-walled, smooth, negative in Melzer’s reagent, acyanophilous, with a short rounded apiculus. CHINA. Yunnan Prov., Hoching County, Sungkuei, alt. 2200 m, on dead twig of Pinus yunnanensis, coll. S.H. Wu & S.Z. Chen, 1 Aug 2001, Wu 0108–30 (TNM F13635); Chuhsiung, Tzuhsishan, alt. 2400 m, on dead twig of Pinus sp., coll. S.H. Wu & S.Z. Chen, 2 Aug 2001, Wu 0108–36 (TNM F13643). The species is so far known only from the temperate belt in northwest part of Yunnan Province, China. Another bi-sterigmate species from the H. setigerum complex, H. bisetigerum Boidin & Gilles, was described from Madagascar (Boidin and Gilles, ). However, this species differs from H. pinicola in bearing shorter basidia, shorter basidiospores, and heavily encrusted septocystidia (see key). In the global survey of the H. setigerum complex (Nilsson et al., ), the largest spores (12–14.5 × 4.5–5 μm) were found in the material from Greenland; these however are shorter than in H. pinicola. According to a detailed morphological study of H. setigerum in Belarus and northwest Russia (Yurchenko and Zmitrovich, ), the largest spores do not exceed 14 μm long, with averages from 7.3 to 11.2 μm. The average spore size in H. pinicola specimens was 15.1 × 4.3 μm (holotype), 14.4 × 4.3 μm (TNM F13635), and 14.1 × 4.5 μm (TNM F13643). The preference of growing on coniferous wood is rare for H. setigerum s.l., and it is a distinctive ecological feature of H. pinicola. The 5.8S-ITS2 dataset analyzed by Bayesian analysis included 356 positions together with introduced gaps (99 positions in partial 5.8S, 86 of which were constant; 257 positions in complete ITS2, 66 of which were constant). MrModeltest suggested GTR + I + G as the best-fit model of nucleotide evolution for 5.8S + ITS2, K80 for partial 5.8S, and GTR + I + G for the whole dataset. The aligned datamatrix of partial 28S sequences included 882 positions, of which 820 were constant. The best-fit model of nucleotide evolution suggested for it by MrModeltest was GTR + I + G.
Both phylograms generated using Bayesian approach (Figures 3 and 4) confirmed that H. pinicola belongs to the genus Hyphoderma. According to the phylogram based on 5.8S-ITS2 (Figure 3), three specimens of H. pinicola constitute a well-supported clade (with Bayesian posterior probability value, PP = 1.00) within the H. setigerum complex. The phylogram based on partial 28S (Figure 4) demonstrates that three specimens of H. pinicola also constitute a separate clade (PP = 0.88). They belong to a highly supported clade (PP = 1.00) together with H. nudicephalum Gilb. & M. Blackw. A high degree of molecular divergence in ITS and 28S sequences supports specific status of H. pinicola. Phylogram obtained to reveal the phylogenetic position of Hyphoderma pinicola via Bayesian analysis (5.8S-ITS2 dataset). Numbers above branches denote Bayesian posterior probability (PP) value (if PP ≥ 0.50). Thick branches have PP ≥ 0.99. Scale bar for branch length indicates the number of nucleotide substitutions per site. 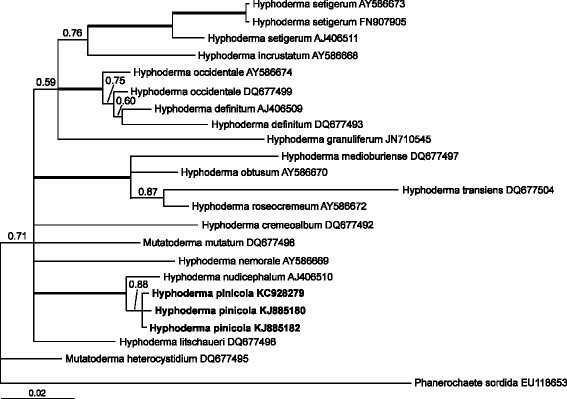 Phylogram obtained to reveal the phylogenetic position of Hyphoderma pinicola via Bayesian analysis (28S dataset). Numbers above branches denote Bayesian posterior probability (PP) value (if PP ≥ 0.50). Thick branches have PP ≥ 0.99. Scale bar for branch length indicates the number of nucleotide substitutions per site. A test of the application of molecular phylogeny in taxonomy is whether there is consistency between classification schemes based on molecular characters and morphological traits. Our results demonstrate certain congruence between morphological study and ribosomal gene sequence analyses. The phylogram inferred from 5.8S-ITS2 shows H. pinicola as a member of H. setigerum complex. All specimens of the H. setigerum complex constitute a separate, strongly supported clade. However, the H. setigerum complex appeared to be not monophyletic according to 28S-based phylogram. This phylogram shows that H. pinicola and H. nudicephalum are separate from H. setigerum. Basal branching order in 28S-based phylogram is not strongly supported by Bayesian posterior probability values, indicating that phylogenetic differentiation within the genus is not deep. 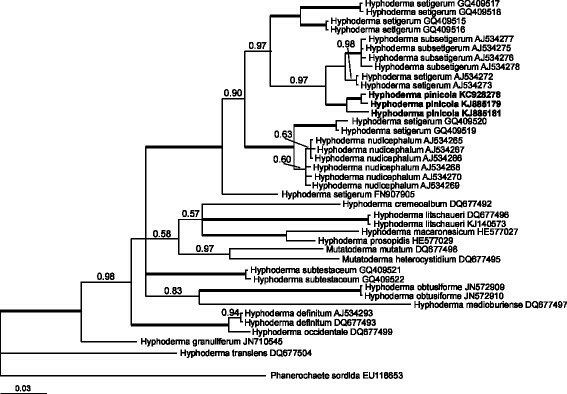 The previous comprehensive phylogenetic study of the H. setigerum complex (Nilson et al., ) provided molecular grounds for recognition of H. nudicephalum and H. subsetigerum Sheng H. Wu. 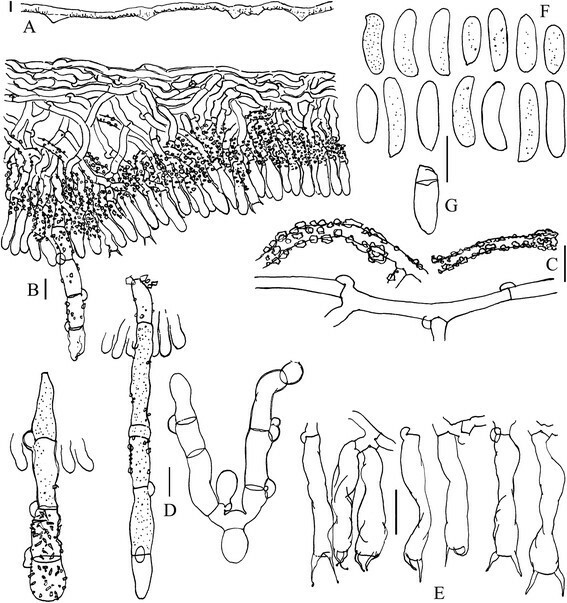 These species were defined morphologically: by characteristic cystidia in H. nudicephalum (Gilbertson and Blackwell, ) and small spores in H. subsetigerum (Wu, ). However, more than ten clades and subgroups were recognized and considered at species rank within this complex. As Nilsson et al. (: 651) noted, H. subsetigerum known from Asia (subgroup 7B) and H. setigerum s.s. from Northern Europe (subgroup 7B, AJ534272, AJ534273) constitute two different species because of incompatibility, geographic isolation and differences in spore size. Hyphoderma pinicola constitutes the third species in this small clade, possessing distinctive features in morphology, host preference, and distribution. The clade composed of long-spored specimens from Greenland is not only geographically, but also phylogenetically far from `H. subsetigerum’ clade (see Nilsson et al., , Figure 1). This analysis revealed that the sister group to the `H. subsetigerum’ clade (i.e. the assemblage of H. pinicola, H. setigerum s.s., and H. subsetigerum) includes specimens of H. setigerum s.l. from Argentina (GQ409515, GQ409516) and South Africa (GQ409517, GQ409518). Both of these clades can be recognized as two independent species. Thus, after phylogenetic reconstructions, presumably new species from geographically separated areas appeared to be discriminated in highly supported clades on the basis of the 5.8S-ITS2 dataset only. Two specimens of H. subtestaceum (Litsch.) Donk (GQ409521, GQ409522) were included in our phylogenetic study. According to Mycobank, H. subtestaceum is a synonym of H. setigerum. However, in the phylogram based on 5.8S-ITS2 sequences (Figure 3), these two specimens constitute a highly supported clade (PP = 1.00) separate from the clade that includes the H. setigerum complex. These results suggest that specimens from North America, called H. subtestaceum, belong to an independent species. Hyphoderma pinicola, known from Yunnan Province, China, and collected on dead wood of Pinus yunnanensis, represents the fifth named species of the H. setigerum complex. This study was supported financially by Ministry of Science and Technology of ROC (grants NSC 98-2621-B-178-002-MY3 and NSC 101-2621-B-178-001-MY3). We are grateful to S.Z. Chen (TNM) for the help in managing herbarium specimens for this study and to Y.P. Chen for performing DNA extraction and amplification. EY prepared description and illustration for the new taxon, performed phylogenetic analysis, and prepared the manuscript. SHW collected the specimens and provided preliminary identification, suggested the study topic, guided molecular lab work, examined the taxa used for phylogenetic study, and revised and prepared the manuscript for submission. Both authors read and approved the final manuscript.